Police continue to investigate Palm Springs’ second double-fatal car crash in week, according to officials. 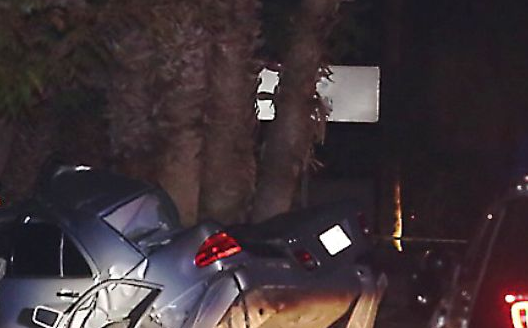 A 21-year-old man from Winnetka and his 38-year-old passenger from Los Angeles were both pronounced dead at the scene after their 1999 Mercedes-Benz crossed over the middle of the road and crashed into a palm tree. The car was heading east on Racquet Club Drive when the crash happened about 10:30 p.m. on Saturday. The names of the two dead have not been released. The crash happened just hours after hundreds were at the First Baptist Church in Palm Springs to mourn the loss of 18-year-old Tierra LeeAnn Reagins, one of two pronounced dead at the scene of another crash that occurred on August 31. Funeral services for the other death in the August 31 crash are still pending. Osvaldo Ramirez, 21, of Cathedral City had two young children and another on the way. In the crash that took the lives of Ramirez and Reagins, their Cadillac slammed into a traffic police at Gene Autry Trail and Tachevah Driver, splitting the car in half. The crash happened about 3:10 a.m.
Jonathan Garcia-Avila, also 21 and from Cathedral City, was driving the Cadillac and was severely injured. Another passenger in the car received only minor injuries. Garcia-Avila has been charged with two counts of murder and one count of DUI gross vehicular manslaughter. For a free consultation with a top accident lawyer please call AA-AccidentAttorneys at 800-260-2577. We come to you anywhere in CA! We average a 98% success rate for our clients! If we don't win - you DON'T pay! On the way back from a trip I was stopped for traffic and someone rearended me. I got an injurys to my knee, back, and also my neck. I came to AA Accident Attorneys about 3 days after the accident. I was very happy with how they handled everything and the settlement was the maximum amount that the insurance company would allow. I am very happy with AA Accident Attorneys. I’d never been in a car accident in my whole life.I had originally hired an attorney, and he had dropped my case. So I came to the Accident Attorneys and they took on my case. They were amazing. They did a really good job. And I didn’t have to handle anything. In the end I’m very satisfied with my settlement. The only people that looked out for me was AA Accident Attorneys. I can never thank you guys enough. I was totally surprised by how much money you guys were able to get for me. I’m really excited about the settlement I got. I couldn’t be happier with AA Accident Attorneys! We found Accident Attorneys, and finding them was probably the best thing that happened to us right then, because we were very well taken care of. They came out to us. We didn’t have to go to them. We was very well compensated financially. If I had to recommend an attorney, I would recommend them. $ 2,000,000 from Security Company for Negligent Security Protection Public on Commercial Property. A personal injury law firm with over 40yrs combined experience. Managed by Paul E Lee, Esq., a retired police officer. With a 98% success rate and a no pay unless we win guarantee* - you know you're hiring a firm that will do whatever it takes to get you fully compensated!